In a recent report to the UN General Assembly in New York, Prof. David Boyd, UN Special Rapporteur on human rights and the environment, noted the time had come for the United Nations to formally recognize the human right to a healthy environment. Read the press release here. For the full report to the UN, see here. David R. Boyd is an environmental lawyer and internationally renowned expert on human rights and the environment. He has a PhD in Resource Management and Environmental Studies from UBC, a JD from the University of Toronto, and a business degree from the University of Alberta. His primary focus is on identifying laws and policies that will accelerate the transition to an ecologically sustainable and just future, both in Canada and across the world. Areas of particular interest include environmental justice, environmental rights and responsibilities, the rights of nature, the debate between regulation and economic instruments, and urban environmental issues. 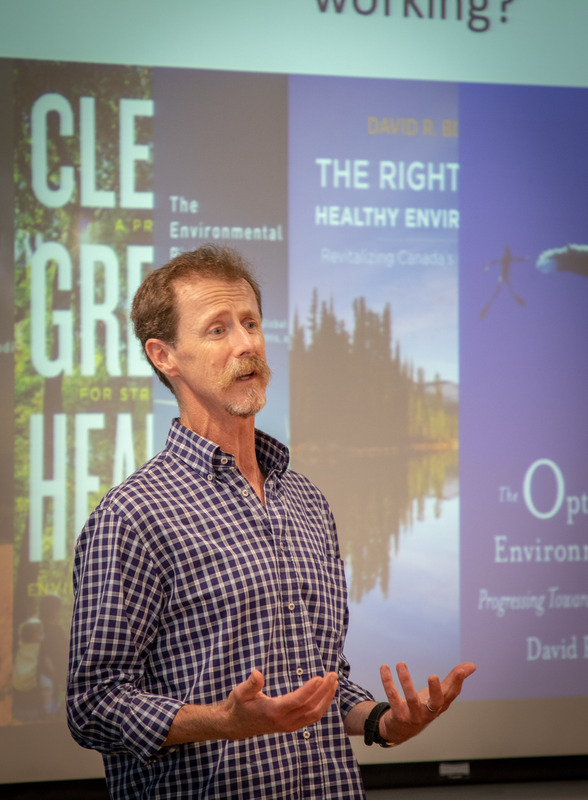 Boyd is the author of seven books and over 100 articles on environmental issues. His most recent books include The Optimistic Environmentalist (ECW Press, 2015), Cleaner, Greener, Healthier: A Prescription for Stronger Canadian Environmental Laws and Policies (UBC Press, 2015), The Right to a Healthy Environment: Revitalizing Canada’s Constitution (UBC Press, 2012) and The Environmental Rights Revolution: A Global Study of Constitutions, Human Rights, and the Environment (UBC Press, 2012).